It's finally time to announce the latest changes within our staff restructuring. This process has taken far longer than anticipated, but finally, after many months, these are the latest changes within the staff at Cayman Airways Virtual. Andrew McBean [Events Director] - For years Andrew has worked tirelessly to keep our events division afloat, or asky as the case may be. His efforts are evident, without Andrew we wouldn't have been able to come together and enjoy the flights we all cherish today every week, for your commitment to excellence and constant efforts, we thank you. Tayvis Walters [Applications Director] - Another long standing member of the airline, Tayvis has put in more than his fair share of hours behind the scenes at Cayman Virtual. Most of you wouldn't even be here today if it weren't for this young man, having being the man to add new pilots for years, his role was vital in the operations of this airline, for your services, we thank you. Both of these young men will be remaining within our airline, they are simply stepping down from their positions to allow more time for themselves in their ever more demanding real world commitments. Please joining me in thanking them for their efforts and wishing them all the very best in their future endeavors. Jeremy Geddis [HR Deputy Director] - Jeremy is no stranger to Cayman Airways Virtual, as one of the very first pilots to be a part of the airline, he has seen this airline grow and has held various staffing roles throughout his years with us. A while ago we did away with our applications department, the tasks handled by its staff were decided to be handled by our Human Resources department instead. As the HR department underwent its own restructuring the position of HR Deputy Director was created, Jeremy has been chosen to fill this position. He brings with him experience, understanding, as well as professionalism and I am certain he will settle in to his new role without any problems. Welcome back to our staff Jeremy. Tevin McCleod [EuroCay Airlines Deputy Director] - Tevin has been a pilot with Cayman Airways Virtual for a few years now and is one of our most active Teamspeak users. His commitment to the airline and its betterment is inspiring and we are very lucky to have him join our staffing team. Tevin will be joining William in the running of our European division, EuroCay. Welcome aboard Tevin, make me proud! Rashon Connor [CaribCay Airlines Deputy Director] - One of our youngest pilots, but don't be fooled, Rashon has a passion for aviation that runs deep. Rashon has also been with us for a few years now, he brings a wealth of ideas and a fresh new perspective, he will be joining Moses in the management of our Caribbean division, CaribCay. Welcome aboard Rashon! AmeriCay Airlines Deputy Director - Assisting the director with the management of our North American division, any applicant will need to be readily available at a moments notice to update any documentation required by our pilot base, offer our pilots in depth knowledge of your divisions operations, be available for discussions on our Teamspeak server, join us in Vatsim flights and assist with the upkeep of your divsion. You will not only work with the director of AmeriCay, but also liaise closely with our other divisional directors and deputy directors. Feel free to shoot me an email/PM/FB Message/TS Message/Airline contact form with any interest you may have in this position. 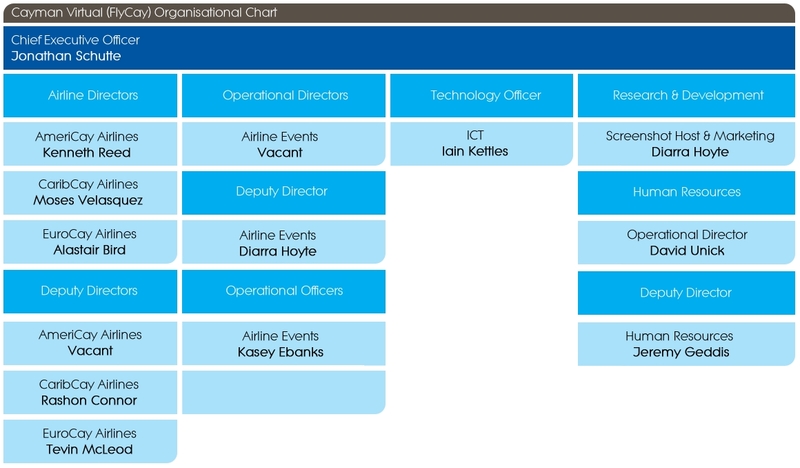 Airline Events Director - With our previous director having stepped down, the position is now open to all. Would you like to plan and announce the events for our airline? Obtain feedback from your fellow pilots and work closely with our divisional directors to assist promotion of new routes and aircraft, all of these and more will be your responsibility with this role. Airline Events Co-ordinator - Working under the director of events, your job will be to assist in the creation, maintenance and announcement of events for our airline. You will work with other virtual airlines and virtual air traffic organizations to get as much interest in our events as possible and to boost our numbers in participation. That is all for now, thank you all for your time. Firstly, I must say it has been a great pleasure serving the Pilot Community as an Applications Officer, Director of Applications over the past years. I have come to terms with quite a few of you all, and have appreciated the support some of you all have shown to myself, as well as my former staff members. We've had our good times and our not so good times here at FlyCay, and I am sure memories will certainly live on. David and Rashon - I thank you both for assisting me to carry out my duties effectively, efficiently and timely during your tenure as Senior Applications Officer, Applications Officer and Junior Applications Officer. Without your tireless efforts, we would not have been able to stay committed to the Virtual Community and serve the pilots, as we were instructed to do. Deputy Director for CaribCay - Rashon. Gentlemen, I wish you both well during your years to come here at FlyCay. - Congratulations both. Tevin - Congratulations on your recent appointment. I do certainly look forward to your fruitful and exciting plans for the subsidiary in which you co-head. Inclosing, Diarra/Kasey - continue to keep your heads up and strive to be the best Events team. I do hope that you all will have some exciting plans for the pilots here at FlyCay, and I do certainly look forward to the day where we have pilots out in their numbers flying events. Diarra Hoyte: Recently Graduating High School with High Honors, and enrolling into the A.S program at UCCI. Gerome Bodden: Recently gaining successful employment with our Cayman Islands Government. David Unick: Recently completing the first 11 years of school, completing crucial Y.11 exams and moving unto 6th Form studies. Andrew McBean: Recently Graduating from C.I A-levels, currently pursuing a Bs/Ms in Aviation Human Factors at the Florida Institute of Technology. Nathan Brooks - Succesfully launching his own small photography business, gaining clients on island and in our sister islands. Zachary Powery: Currently pursuing his BSc degree in Accounting, minoring in Law. Rashon Connor - Gaining employment with a Leading propert management company on island. Zachary Larsen: Successfully obtaining his PPL and moving on to his Commercial Pilot's License. Tevin McLeod - Successfully enrolling into Aviation School in the United Kingdom, acquiring a World recognized IT certification. with a leading law firm in the world in their I.T department, and also acquiring 4 high level certifications in the IT field. Last edited by CAY117- David; 07-27-2014 at 05:22 PM. Thanks for the kind words Tayvis. Everyone working hard and to repeat Mr Hoyte words, thanks for the kind words brother. Thanks Tayvis for your well wishes, and for your mentoring over the years. Last edited by CAY117- David; 07-27-2014 at 04:50 AM. Glad to see some of our youngest members moving on up in the staff ranks to contribute more towards the airline. Thank you for the very kind words Mr Walters, and I wish you all the best in your future endeavors. Last edited by CAY117- David; 07-30-2014 at 02:55 AM.